Non-enveloped, head-tail structure. The icosahedral head is about 54 nm with a knob-like neck. The tails is contractile, has a baseplate and 6 short fibers. Linear, dsDNA genome of about 40 kb, encoding for 56 proteins. 50-150 bp and about 2 Kb of bacterial DNA are respectively covalently linked at the left and the right end of Mu genome. The presence of these pieces of bacterial DNA is due to the headful packaging mechanism. 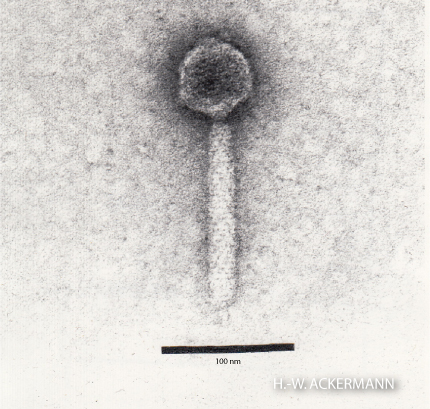 Adsorption: the phage attaches to the target cell lipopolysaccharides (LPS) through its tail fibers. 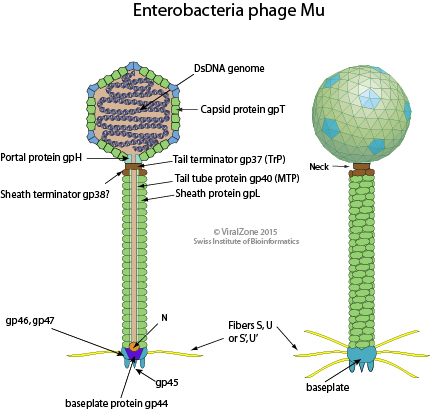 Two types of fibers are encoded by the phage to allow receptor tropism switching. Viral DNA ends are protected from degradation by host nucleases. ?Transcription and translation of early genes? Circularization and supercoiling of the viral DNA. Integration of viral DNA into the host chromosome. Replicative transposition gives rise to 50-100 new copies of the viral genome in the host chromosome. Assembly of an empty procapsid. Momylation of viral DNA (modification of adenines) makes the packaged viral DNA resistant to host restriction enzymes.